Fighting Irish Thomas: We Have a Warren for your Address!Is Rick Barack's Correct Invo Pick? We Have a Warren for your Address! Is Rick Barack's Correct Invo Pick? 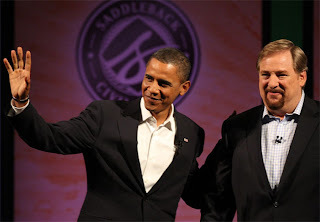 On the surface, something about Barack Obama picking Rick Warren to give his inauguration invocation seemed fishy. I mean, Warren was the man responsible for one of Obama's few (and perhaps biggest) campaign faux pas, when he made Barack look silly last summer trying to answer the question "When does life begin?" But then I realized that Barack, brilliant politician that he is, was using his special reverse "If I can't beat him, join ME!" psychology, already duping Warren and many of his on-the-surface Christians into his camp for the next election. However, while I predict this pick for Obama will fit Obama just perfectly, I see one potential problem in the strategy for Warren. Namely, donuts. Certainly, having garnered nearly 95 percent of the African-American vote last November, Obama has nothing to gain by having a fiery black preacher give this keynote sermon. And, judging by the sheer numbers garnered by Warren's self-help spiritual best sellers, Rick is nothing if not popular with the white, evangelic crowd, one of the few voter blocks Barack did not succeed with. Plus, Obama is looking for a church, and while I don't see Barack spending much time in California, he can always attend Saddleback's services via satellite or online! Still, there seems to be one flaw in the master plan, a fly in the ointment in the form of the unhappy gays, the kind that are not "gay" at all, but are always protesting when a conservative Christian comes to town. And here's where the scenario gets messy, if not doughy. For unlike some of his left wing contemporaries, Warren has preached against abortion and gay marriage, which of course sets him apart from protesters, if not the president-elect himself. But in the past, he has sung this tune only to the choir, a congregation, large though it may be, that was largely in agreement with him. Although I'd love to be proved wrong and see Warren give a no-holds-barred Mother Teresa type prayer breakfast abortion-is-murder-and-that-makes-YOU-the-murderers speech that basically burned her hosts, the Clintons, to the ground, Obama is counting on Warren to deliver a typical wimpy "God is good, and, despite our differences, Barack is great!" type oracle, and the smart money is on Warren, who in the past has always been more profiteer than prophet, to comply. As for the gays, Rick's tried and true homosexual policy "When the (gay) protesters come, we serve them water and donuts" strategy no doubt comes into play. But will it be (and will there be) enough? In the end, perhaps the donut is the perfect symbol for both Warren's own cult status and his health and wealth creed. Not only is water and donuts the final, most watered down version of the bread and wine that for Catholics becomes the life-changing, truth-engaging Body and Blood of Christ, it shows that despite his popularity, Warren realizes he has no real moral authority to say to the gays that their so-called Biblical justification for their lifestyle is any less valid of an interpretation than his own. While in the past Christians realized a prophet sometimes out of love would have to say "Do not," today the donut is the symbol of tolerance, the doctrine where everyone (and everything) is okay. Of course, while "Do not" could initially be bitter, in the end the Christian realized that this self-sacrifice was sometimes necessary for selfless service. On the other hand, the donut is always initially pleasing, but over time is not only not filling, but fattening and even deadly. If Warren sticks to his Donut Theology, I believe his invocation not only makes Obama's choice of Rick look sweet, but the prime-time preacher possesses the skill to still deliver enough literal and figurative goodies to the gays to keep them at bay. But if Warren can somehow come up with enough courage to delineate with love and detail the sins (and need for repentance) of both the protesters and the president, he may lose his pastor role but save his soul (as well as some of theirs) in the process. Put both the donuts in one boat and send them over the Niagara ! Great pcik by BHO. I hope it enflames Wright his "spiritual mentor" into saying something stupid.